Another favourite story of ours for Christmas is Lucy M. Boston's The Children of Green Knowe. Like The Box Delights this was also adapted as a children's drama by the BBC, and was also pretty creepy. Unfortunately not available on DVD but we did find the episodes on YouTube, below is a link to the first part of episode one. While looking on line for more information about the book we came across this very interesting article about the house upon which Green Knowe was based, Hemingford Grey in Cambridgeshire, which is now run by Lucy Boston's daughter-in-law Diana Boston. 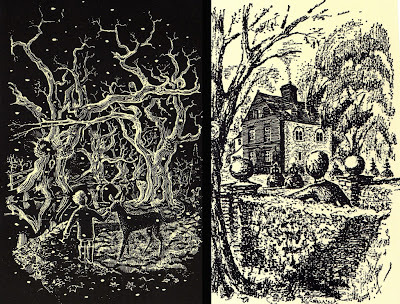 Diana's late husband Peter provided the illustrations for his mother's novels, some of which can be seen below. I love Hemingford Grey - beautiful friendly place, just as it is in the books. No sense of stately home or tourist attraction about it. (Sigh of happiness). 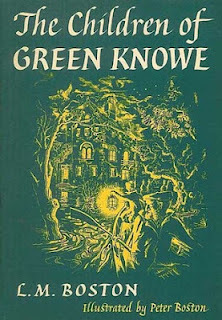 Ahhhh, The Children of Green Knowe.... nothing could surpass my love for that show when I was a child. It had a creepy old house, moving statues, ghosts and lots of cosy teas. Brilliant! We can confirm, having watched the entire series again curtesy of YouTube, that it really is creepy as we remembered it. Though we managed not to resort to hiding behind a cushion, we will be giving any sinister looking trees a wide berth for a while.